The Honest and Open New EPA Science Treatment Act, also known as the HONEST Act, requires the EPA to provide access to the science it uses when issuing new regulations. Specifically, all actions taken by the EPA must be based on the best available science, the science must be specifically identified, and it must be publicly available in a manner that will sufficiently allow for independent analysis and the reproduction of results from the scientific research used by the EPA. The EPA Science Advisory Board Reform Act brings much needed reforms to the Science Advisory Board by providing more oversight and transparency. The Science Advisory Board was established to provide independent reviews of the research conducted by the EPA in the rulemaking process. Specifically, the bill prohibits the board from appointing members who are registered lobbyists, requires at least ten percent of the board members be from state, local, or tribal governments, requires the Board to respond to dissenting scientific views, and it requires the board to make all relevant scientific information available to the public at the same time they are made available to members. ATTENTION FARMERS IN THE DISTRICT: On March 15th and 16th, the last season freeze in Georgia had a devastating effect on our fruit and vegetable crops with blueberries taking the brunt of the impact. In response, USDA RMA issued a Managers Bulletin that encourages producers with insured crops that have been impacted by the freeze to contact their crop insurance agent immediately to assess the crop and report their loss. These actions are of timely matter and our producers need to initiate the appropriate steps to ensure the health and vitality of future crop harvest. As always, please contact my office if we can further assist you throughout this process. The contact information for all four of our district offices can be found HERE. 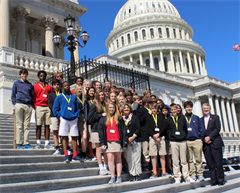 Happy to host students from Episcopal Day School! Next week is spring break! We already have a lot of folks booked for tours up in Washington, D.C. but if you need help in reserving a tour of the Capitol, please sign up on our website HERE. We would be happy to help show you around this historic site! Delegates from AIPAC and I had the chance to speak about the importance of the United States’ relationship with Israel. With ongoing threats in the Middle East, our national security is directly tied to the security of Israel. 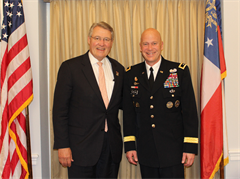 I met with Major General John Morrison, the Commanding General for the U.S. Army Cyber Center of Excellence. Fort Gordon, right here in the 12th District, is home to the Cyber Center of Excellence and the future home of the U.S. Army Cyber Command. I will continue to fight in Congress to provide our military the resources they need. I was honored to receive the Distinguished Community Health Advocate Award from Christ Community Health Services Augusta. Christ Community provides quality health and dental care for those less fortunate in our community, and I admire the inspirational work they do throughout the Augusta area. The President signed four pieces of legislation into law this week—all using the Congressional Review Act, which allows Congress to roll back rules and regulations passed in the eleventh hour of a previous Administration. We are fulfilling our promise of rolling back harmful rules and regulations that shift too much power to Washington. The President also issued an Executive Order to review the Clean Power Plan, a reversal of the last Administration’s climate change agenda. I believe the Clean Power Plan, one of the most drastic environmental regulations in history, did very little to help the environment, but instead, burdened families through reduced income, stifled economic growth and increased electricity costs. What do you think? You can email me ⇒ HERE, contact any of our offices or join the conversation on Facebook, Twitter or Instagram. I hope you have a great week.